Add spices and stir fry for a few more minutes and add peas and carrot. Line a baking tray with nonstick baking liner or lightly mist with oil. Take a piece of dough, make a ball and flatten it out into a disc about 4″ in diameter. 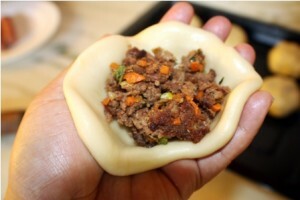 Add a tsp of mince meat stuffing in the center of the disc and pinch all the end towards centre to cover the stuffing. 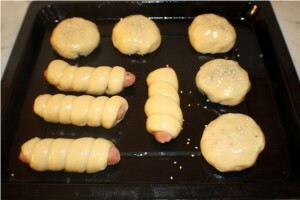 For the sausage rolls, roll the dough into long tube and wrap it around the sausage as shown in the picture. Place each bun, about 2 inches apart on the baking sheet (4 rows with 3 rolls each). 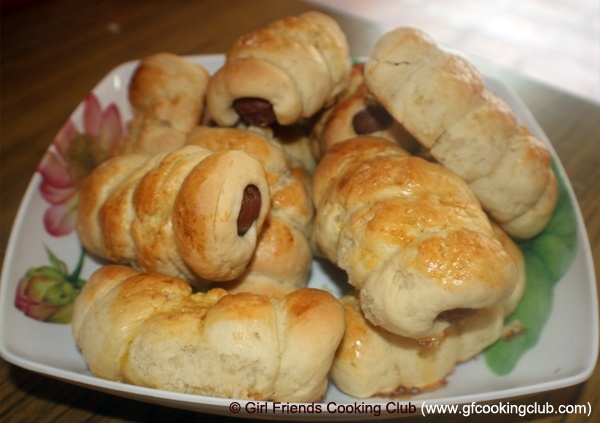 Set aside the buns/rolls at room temperature for about 30-40 mins until they just begin to swell. Just before baking,thoroughly whisk the egg with 1 Tbs. water and brush all over each bun. 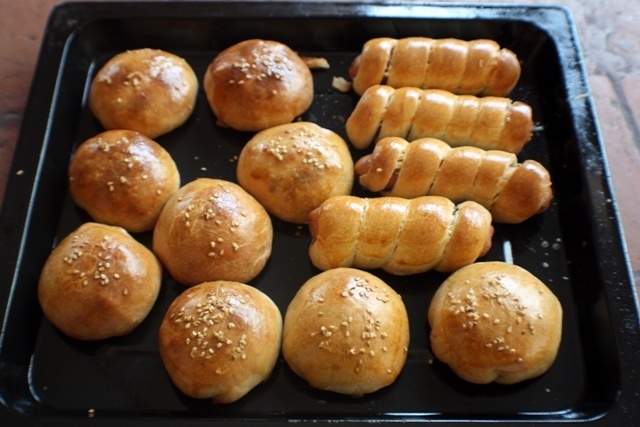 Sprinkle poppy or sesame seeds (if using) on the buns. Preheat oven to 190 degrees C. Bake on the center rack for about 20 minutes, until golden brown. Remove and let cool on a rack for 20 minutes before serving. Note : I have made both the sausage rolls and the mince meat buns for demonstration. But the dough mentioned in the recipe should be sufficient for 12 rolls or 12 buns . 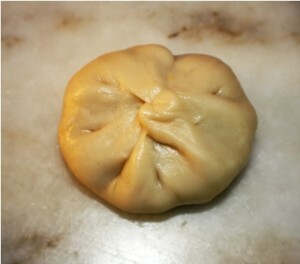 The Yeast is very important factor,let it be active and fresh,otherwise the whole recipe is flop. If your yeast mixture does not have bubbles and become frothy in 10 mins, then discard the yeast and try with a fresh packet again. You can use any stuffing for your choice, like spicy potatoes, cottage cheese, sweet custard etc. This entry was posted in All Recipes, Breads/Cakes/Rotis/Parathas and tagged Masala Buns, Mince Buns, Sausage Rolls by Kamakshi. Bookmark the permalink. 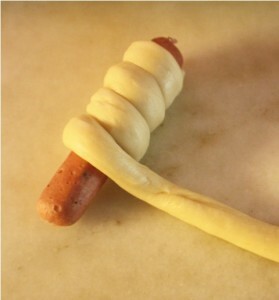 hi, i just went through your recipe..want to try this at home for my nephew coz he is a sausage lover..but i got a problem..we have a micro wave so can you help me to make this recipe in a micro wave?? awaiting for your kind reply..